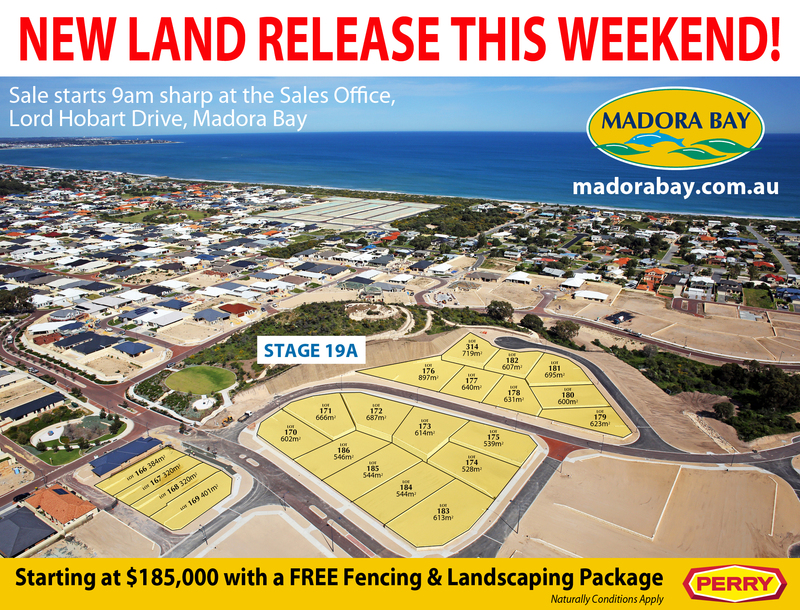 Madora Bay will be releasing a limited range of brand new home sites for sale on Saturday 1st September 2018. There has been a great deal of anticipation for the release of this land as it contains several larger sized blocks up to 761sqm. Stage 22A is located on the south side of Orelia Street along Eleanore Drive, Bonnington Loop and Elderslie Rise. A real highlight of this land release is that several blocks have a 17m or wider frontage, perfect for those seeking side access. If you have a boat or caravan to accommodate, you will know that home sites with wide frontages are getting harder to find. All blocks are retained and most are a neat rectangular shape. The blocks are just a short walk to the beach and the new regional shopping centre. Madora Bay has become a highly desirable suburb to live in. Its residents enjoy a lifestyle that is difficult to match elsewhere. There is little traffic generating infrastructure within the Madora Bay Estate so the streets are quiet and safe, yet everything you need is close by. Quality private and public schools are located nearby along with the new shopping centre featuring Coles, Aldi and Kmart plus a number of other specialty shops and dining options. A new Catholic High School has also been earmarked for the development. Madora Bay Beach is the main drawcard to the area. With its powdery white sands and crystal blue waters, it’s the perfect beach for swimming, fishing or just enjoying a walk on a balmy summer evening. Its beach side lifestyle, along with the high standard of homes in the area have seen Madora Bay out perform many other suburbs in the area with consistent growth in value. The new release home sites at Madora Bay will come with a free fencing and landscaping package, subject to the usual conditions. It is expected that these home sites will attract strong interest and be snapped up fairly quickly. We strongly encourage buyers to register their interest with Estate Sales Agent Barry Mitting by calling 0474 440 666. The land sale will start at 9am sharp on Saturday 1st September 2018 at the Sales Office on Lord Hobart Drive. Blocks will be sold on a “first in – best dressed” basis. Florida Beach Commercial Steaming Ahead! Last month H&N Perry launched a sales campaign for Lot 1147 Dandaragan Drive, Dawesville which is a commercial building site located within the Florida Beach land estate. This prime commercial lot is positioned directly opposite a large parcel of land that was snapped up by Coles, who have already submitted building plans for their new shopping centre. Covering 1445sqm on the corner of Bailey Boulevard, the site is in an excellent position to benefit from a strong flow of drive by traffic, particularly with the Caltex Starmart already trading on the same street. The land’s potential uses include shops, markets, liquor store, restaurant, take-away food, offices, consulting rooms, medical centre, retail showroom plus more. 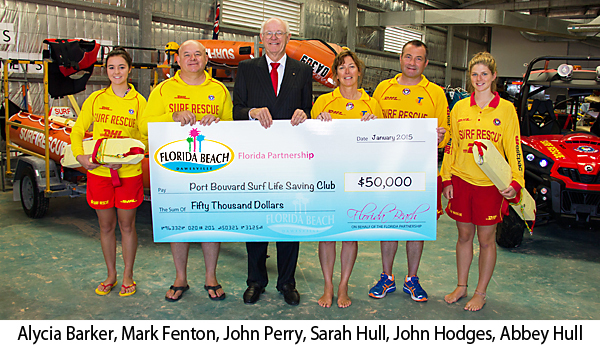 The sales campaign stretched over 5 weeks and consisted of print advertising in The West Property section of the newspaper, print advertising in the Domain section of the Mandurah Mail, website advertising and a Facebook advertising campaign. There was an extremely strong response from interested buyers which resulted in the sale of not only the advertised property, but also the commercial site next door. This is fantastic news for Dawesville residents who have been waiting a long time for some development in this area. There are still some commercial sites available for sale through exclusive selling agents, H&N Perry Real Estate. If you’re interested in getting in on the ground floor, you should contact Frank Lawrence on 0412 903 375. When it comes to building your home, we all know that location is king. So why settle for living on the ‘other’ side of the road when now you can afford to buy on ‘The Right Side of The Road’? This Saturday Madora Bay will be releasing Stage 19A for sale. There has been a great deal of anticipation for the release of this land which features a great range of homesites from easy-care lifestyle lots up to family sized blocks of 897m2. They are priced from $185,000 plus they all come with a FREE Colorbond fencing and landscaping package, naturally conditions apply. Located adjacent to ‘Madora Bay Hill’, these homesites are close to parks and some even feature ocean views down the coastline to Mandurah Ocean Marina. Interested buyers have been waiting patiently (and not so patiently) for the release of this land and it is anticipated that some will even camp overnight at the Sales Office in order to secure their first choice block.